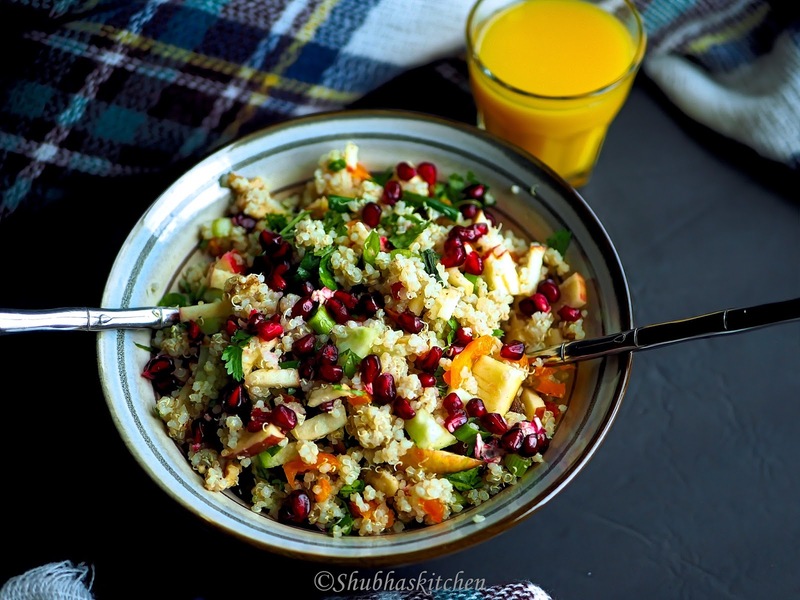 After back to back posts of sweet treats (Almond biscotti, Buttermilk Fruit cake and Baklava), I am back with a healthy and delicious salad recipe "Quinoa Salad". This is not only highly nutritious but very very tasty. 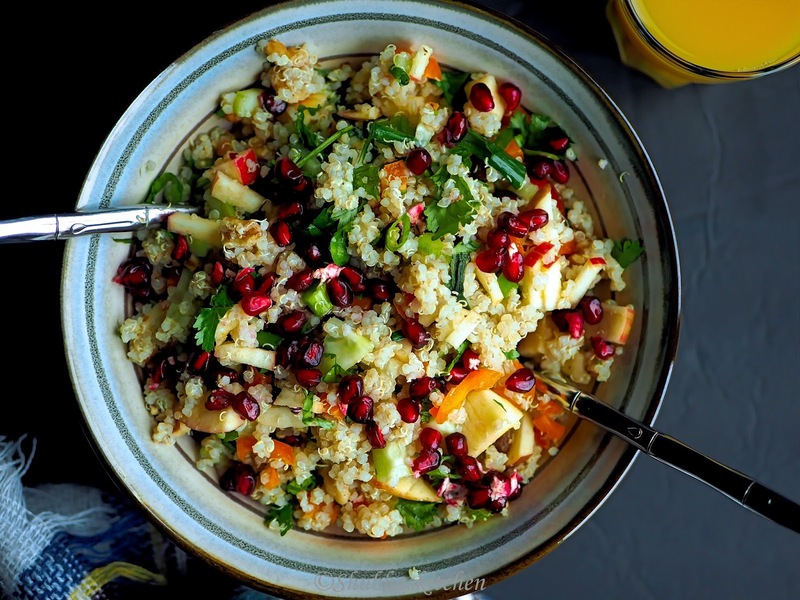 Apart from quinoa, the salad has a good amount of apples, cucumber, raisins, spring onion, pomegranates, walnuts and bell pepper. 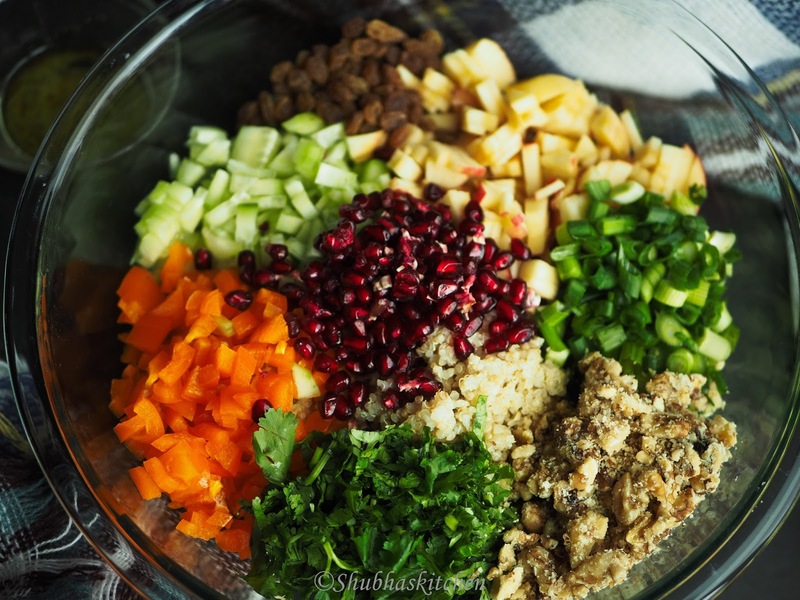 But apart from these veggies, a key component of this salad is "Cilantro" or dhania leaves. I have used a very simple dressing for this salad.I made a dressing with Olive oil, lemon juice , salt and pepper. The veggies used in the salad can be changed. You can add more veggies of your choice or eliminate a few. The salad can be customized as per your liking. There are different kinds of quinoa available in the market. I have tried the red quinoa and white quinoa. 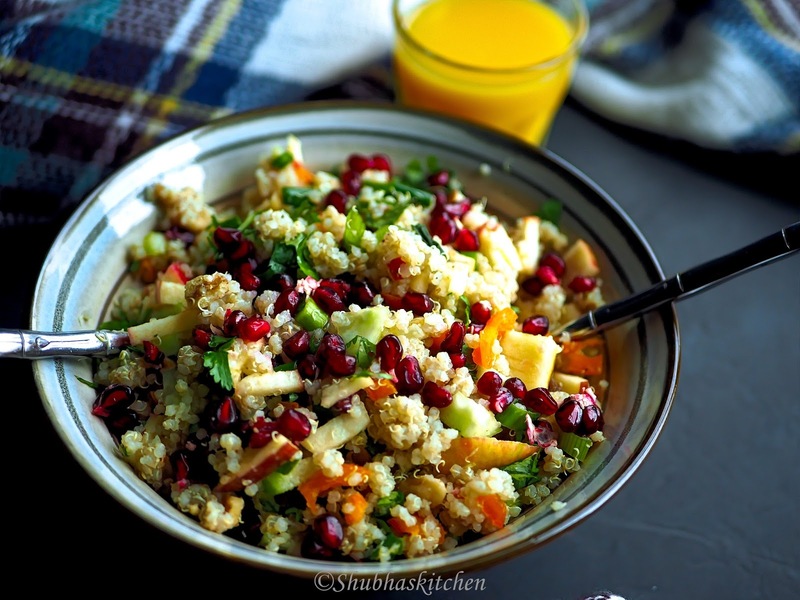 I personally prefer white quinoa over the red quinoa as it has a neutral taste. Red quinoa on the other hand , has a chewy texture with a nutty taste. I prefer using it in making dosas while I stick with white quinoa for other other recipes. So in this particular salad recipe, I will be using white quinoa. How to cook quinoa on the stove top: Bring 2 cup of water to a boil in a deep bottomed pot. When water comes to a boil, add 1/2 tsp of salt to it. Add quinoa. Mix and let it simmer until all the liquid has been absorbed. Using a fork fluff the quinoa. Note: You can rinse the quinoa before using. Also you can slightly toast the quinoa in a tsp of oil and then cook it. 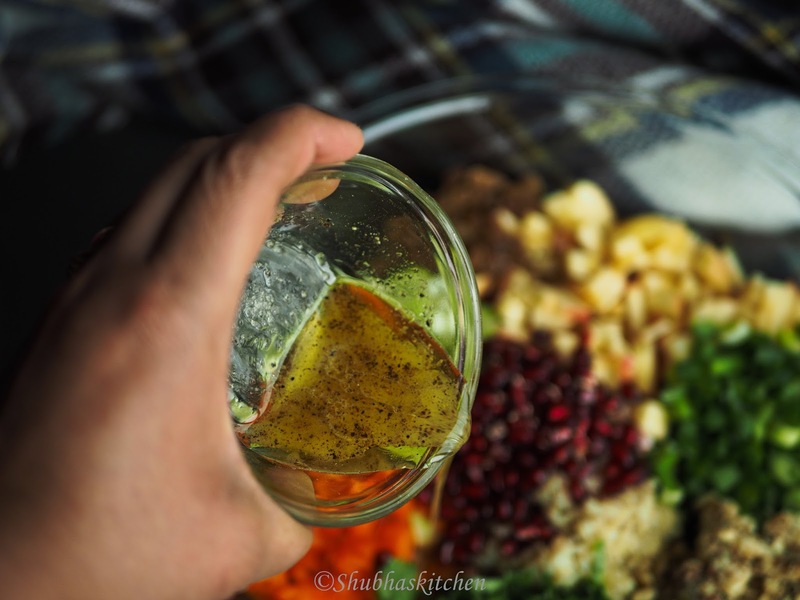 How to cook quinoa using the INSTANT POT: Rinse the quinoa. Put the quinoa in to the steel pot of INSTANT POT. Add 2 cups of water and 1/2 tsp of salt. Close the lid. Place the valve in the "SEALING" position. Pressure cook on "HIGH" in the manual mode for 10 minutes.Once done, turn it off and let the pressure release naturally. 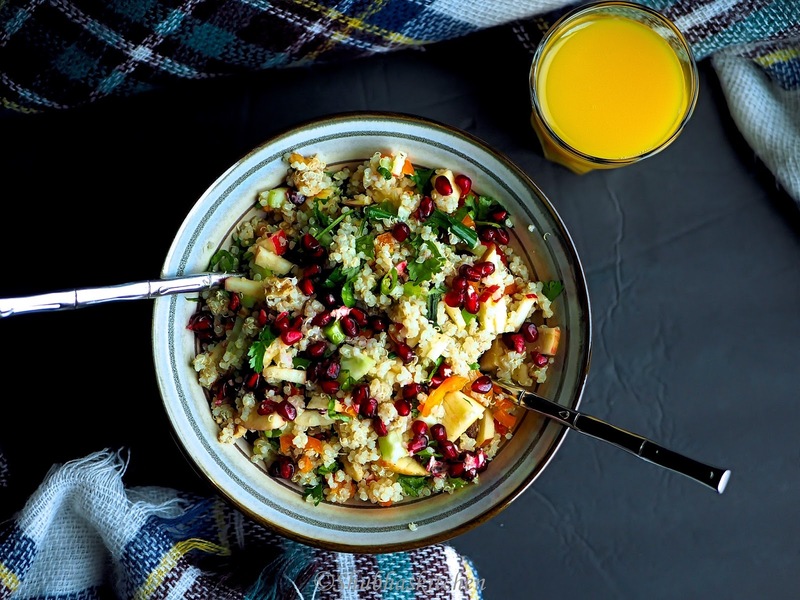 When the button goes down, open the lid and fluff the quinoa using a fork. Mix the oil, lemon juice , salt and pepper. 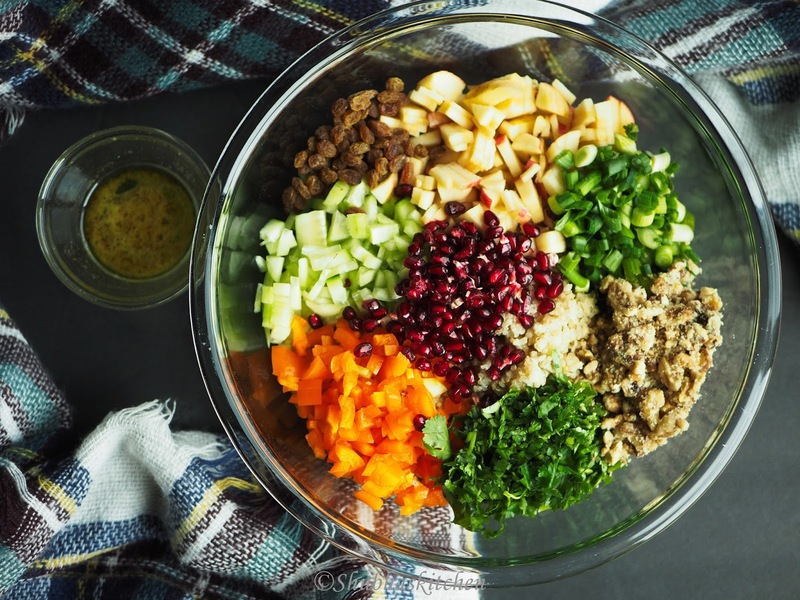 In a large mixing bow, add the cooled quinoa, toasted walnuts, cucumbers, bell peppers, apples, spring onions/green onions, raisins , dates, cilantro and pomegranate seeds. Add the dressing and mix .